If you’ve visited the circus or circus inspired show, you’ve likely seen a performer climbing fabrics to take height for an acrobatic dance in the air. There are many types of aerial performance apparatus out there, and new shapes and designs are being created all the time. It is said, and argued, that the first acrobatic fabric act was created in the late 1950’s at a French circus school. 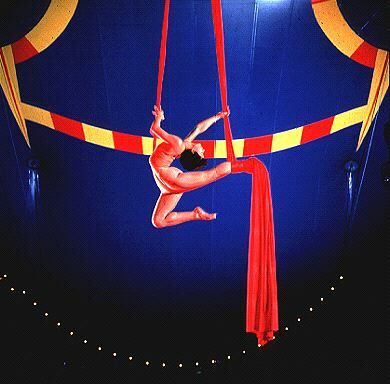 Aerial silks, also referred to as aerial tissu(e), fabric, curtain and ribbons, gained popularity when Cirque Du Soliel debuted an aerial silks partner act in their show Quidam in 1998. Today, aerial silks has claimed its place as both a fitness and performance craze. Aerial training facilities and studios can be found in most major cities, catering to recreational and beginner’s to expert level training. The fabrics are typically a strong, 2-way stretch polyester and nylon blend that come in different lengths, widths and stretch type. We use low stretch fabrics in our studio to cater to beginner’s level training. High stretch fabric is preferred for high level ‘trick’ executions, typically big ‘drops’ and ‘rolls’ from over 15 feet in the air. Aerial silks as a practice is composed of poses and transitions sequenced together to form the aerial dance. Inversions and flips bring in an acrobatic element. Here at Flow Foundry, we have approximately 13 feet of ceiling space. 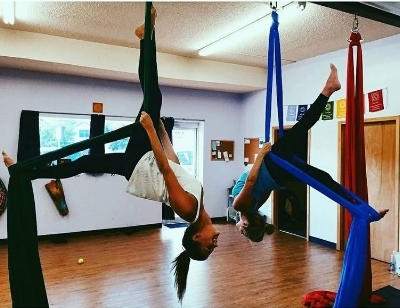 We consider ourselves to be a recreational aerial studio, catering towards beginner’s level silks training as well as aerial fitness conditioning. In a beginner’s silks class we introduce proper form while supporting your body weight, ground level inversions, simple climbs and footlock poses that allow you to be supported in the air without having to hold your weight. We like to show approximately 6 poses in our beginner’s aerial silks workshop that can be sequenced together, albeit with much practice and effort. We start with the basics, on the ground, and work our way to more challenging poses and executions in the air. A strong aerial practice is about 80% conditioning the body and muscles for strength and flexibility, and about 20% learning new “tricks” and poses. We focus on tricks and poses in our beginner’s workshop, while incorporating much needed conditioning and strengthening in our on-going series classes. We consider our beginner’s workshop to be a ‘crash course’ in aerial silks, allowing you to execute some acrobatics and challenge your physical strength while trying something new. This is a great introductory option to the aerial silks practice. For those who wish to explore a more rounded training, our on-going six week series classes allow you to progress while building muscle and flexibility and focusing on muscle control and proper form and technique. We like to share with all of our classes that we all start at our own place, and we are a non-competitive, no judgement zone. If you have a consistent strength training practice, you will be ahead of the curve. We work with you exactly where you’re at, and only suggest you progress when you feel comfortable. We have a 5-1 student to teacher ratio, allowing us to work on both an individual and group level within the same class setting. No two classes are ever alike! We keep our class setting fun and light! We do not have intentions of training professional aerialists, though several of our students have gone on to perform at small local events and become teachers and assistants themselves. We enjoy offering something new and challenging to our community; an engaging physical practice that doesn’t feel like repetitions in the gym and keeps you coming back for more! We also host private groups for an alternative type of birthday or bachelorette party, or studio parties for gymnasts, dancers and beyond. Come give aerial silks a try at Flow Foundry!